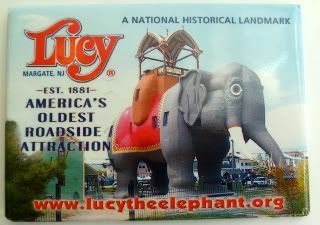 My friend brought back this Lucy the Elephant magnet for me from Margate, NJ, just a few miles down the road from Atlantic City. Just so happens I already magnetblogged on this very same roadside attraction! Tell me you're surprised. A couple of years ago, the AGE10 and I went down the shore (can I say that if it's AC? That's still Jersey Shore, right? ), and we totally dropped by after I spied Lucy's thingamabob (there has to be a proper name for that thing) poking into the air. It's actually one of my big Jersey regrets (don't we all have those?) - that we went only to the gift shop and not up into the belly of the elephant. It must be supercool up in there. Actually, now that I think about it, it'd be superawesome to like, live, up in there. How cool would that be! Nah, you don't need an address. I live in the elephant over on Atlantic Avenue!